Do they not Realize that We are Children of the Same God? Jerzy Kluger, a Polish-born Jew who was the last of the remaining childhood friends of the late pontiff John Paul II, died in Rome on Dec. 31, 2011 at the age of 90 with bronchitis following a long-time battle with Alzheimer’s disease. The boyhood friends met when Kluger was only five years old in their native Poland. Kluger was a year younger than John Paul II, who was born Karol Wojtyla. They grew up in nearby houses in the small town of Wadowice where they spent their childhood. Kluger was a major influence on Pope John Paul II’s relations with Jews during his papacy. 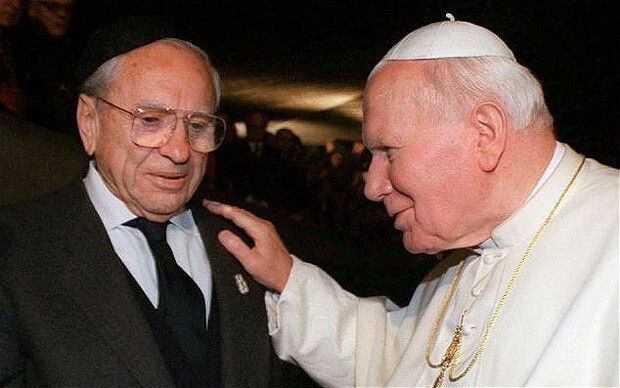 Taking different paths on their lives which separated them, as Kluger survived the Holocaust after being sent to a gulag in Siberia, and Wojtyla becoming the Pope, the two reunited in 1965 and worked together to revolutionize strained relations between Catholics and Jews. Upon the death of John Paul II in 2005, Kluger remembered how one day, he waited for Karol Wojtyla while the future pope prayed in church. A woman approached the young boy and scolded him. She told him a Jew shouldn’t be inside a Catholic Church. Thus, in his early age, the call for social justice has always been in the Pope’s mind. “Do they not realize that we are children of the same God?” Is this not a good point of reflection? Posted on January 5, 2012, in Fairness, Friendship, Human Rights, Philosophy, Religion and tagged john paul II, pope, religion. Bookmark the permalink. Leave a comment.